October is here! Stores are packed with an endless supply of candy, costumes are available at every turn, and many houses are starting to look festive for the 31st. (We like to refer to it as Hearthoween!) We’ve told you about some great DIY wood pallet projects before, but did you know you can use your leftover wood pallets as spooky decorations? We have compiled our four favorite ideas, in no particular order below. Now here’s an easy way to make your house look totally different – and very eery. There are some variations on how you could do this, but the simplest way is to stack the pallets upright and zip-tie them together. 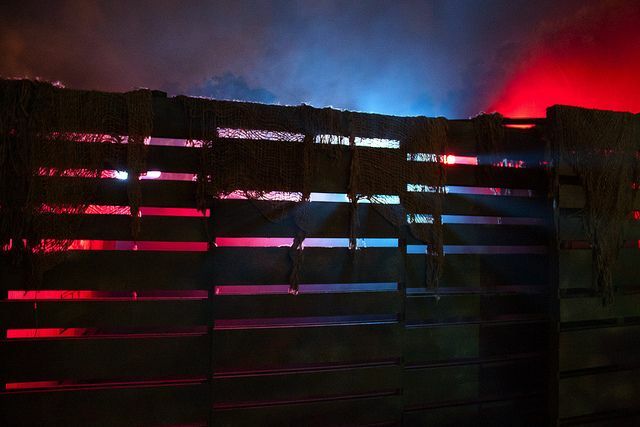 After securing your temporary wall, add your fog machines and back lighting of your choice. This photo shows some extra scary pizazz with dirty netting. Now is the time to get creative with your embellishments!